I’m going to attempt to talk about our foreign language plans. 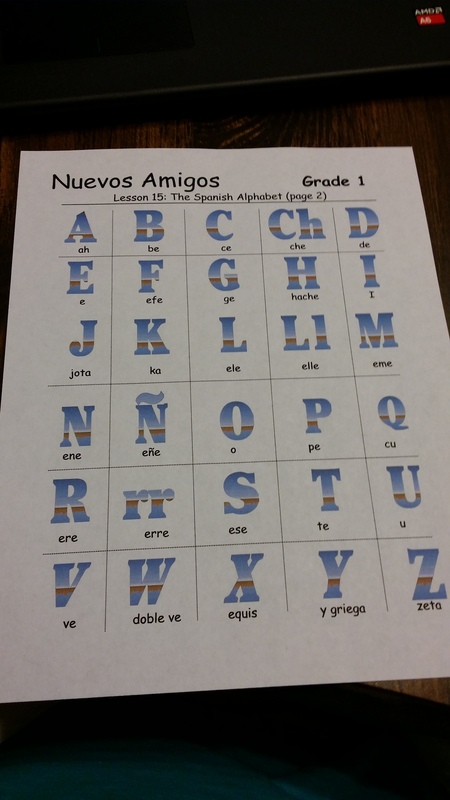 For term 2 and possibly 3, though I’ve not decided yet, we will be working on learning Spanish. I’ve attempted to browse through what Charlotte Mason had to say but honestly it is not helping me at the moment. I do understand that one of her goals was not just learning words and phrases but actively using them in everyday conversations and through out the day. So that will be our goal as well.Here is my reality. I took Spanish for two years in high school and barely passed. Yes, I was that terrible. I have no ability to roll my r which can really hamper oral pronunciation of the Spanish language. I do have two kids with an amazing ability to do that plus a senior who has had the school’s equivalent of two years of Spanish. So I do have some in house help. While browsing YouTube, I found a Spanish video series produce by the Dallas school system called Nuevas Amigos.So far it looks like it runs from pre-k to third grade. I’ve watched several videos from first grade and second trying to decide where I would like to begin. But before I talk about that, let me give the website for the Dallas school system.http://www.dallasisd.org/page/2131 At the website you can learn more about the characters, print out a few coloring pages, and access the grade level teacher guides. Here are some of the charts I printed out to have when needed. 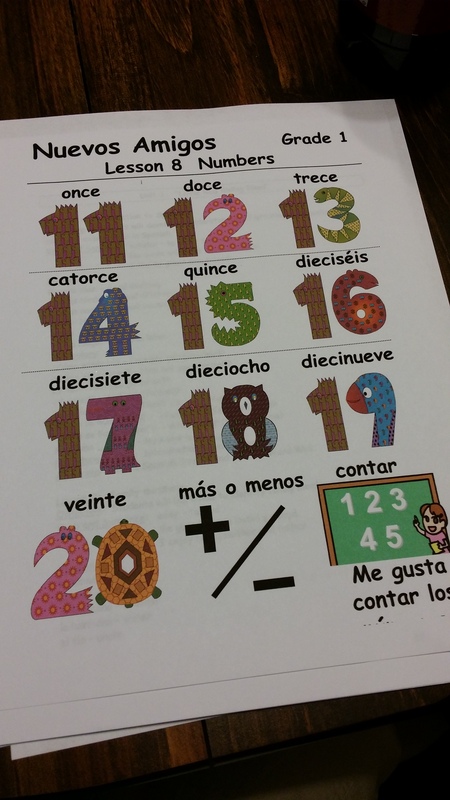 I also printed out just the lesson objectives for grade 1 and grade 2. Here is the youtube channel for Nuevos Amigos. The plan is to watch a video on Monday then practice throughout the week. We will watch it again on Friday as review. I plan to include vocabulary throughout our day as much as possible. We will not focus on vocabulary drills or worksheets. I want to do this in a natural way just like when you learn to talk. I guess you can say we will be doing conversational Spanish. We will skip the grade one videos. I found them not as good a quality as the grade two videos. Also, the grade one videos have a lot of crafts included and that is not a focus for us. I will use the guided printouts to plan our focus. They are also good because they explain how certain verbs differ from our use and meaning or how sentence structure works. These notes are on the side and are for the teachers to use as needed. I did not print those out since those are more guided (this is how to present, etc). I printed out what you would probably call the syllabus which gives the unit number and it’s focus then breaks down into lesson 1, lesson 2, etc. 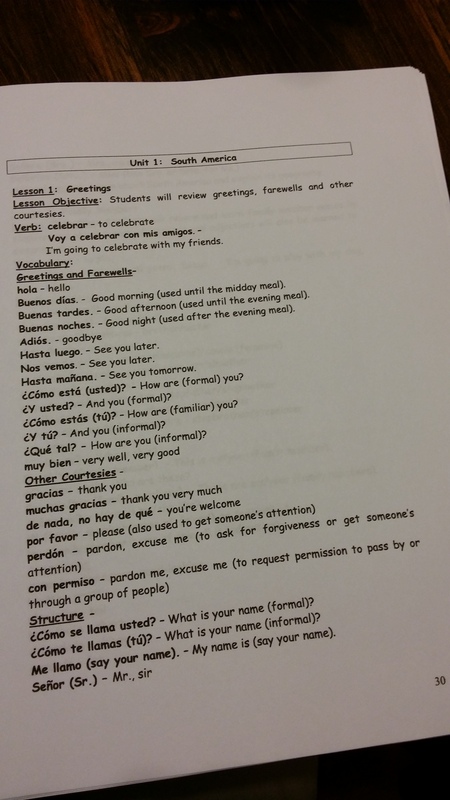 For example: Unit 1 for grade two is titled “South America” then goes to lesson 1:Greetings then follows with lesson objective which is review of greetings, farewells, and other courtesies. 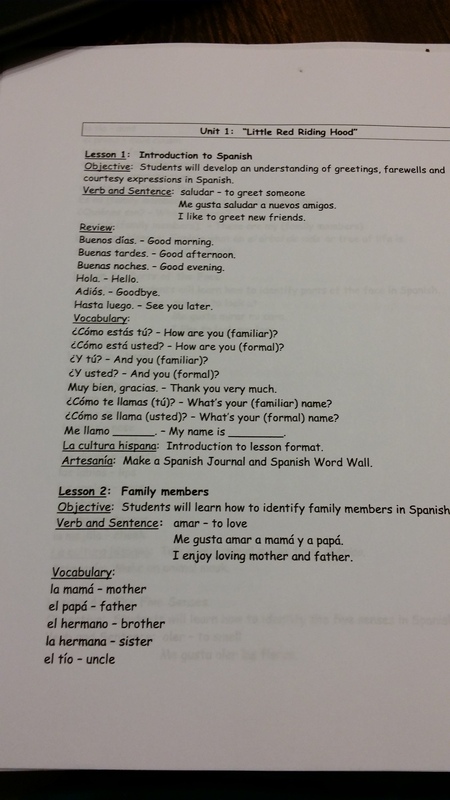 It then gives the verb the lesson focuses on and what it means including a sentence in Spanish and then in English. 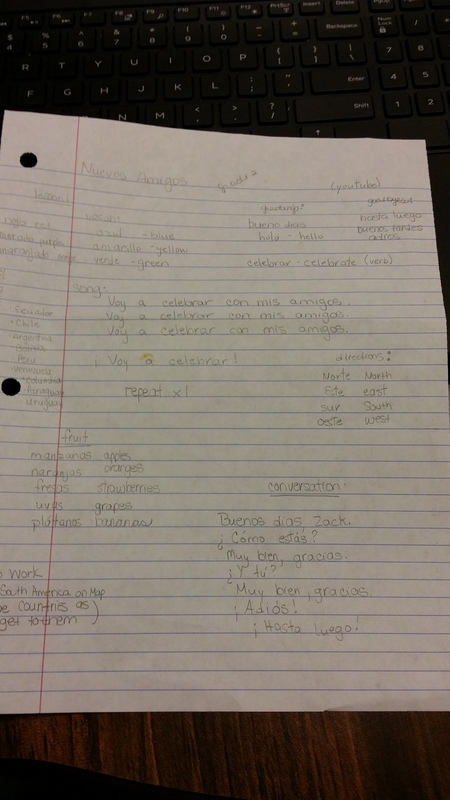 It then list the vocabulary in Spanish and it’s English translation. You can see all this in the two photos I posted above. When watching the first video, I noticed they used names of fruits and colors but those were not included on the video. They also mentioned directions on the compass. Here are my notes. I will be taking time to watch the videos in advance so as to catch these things. It will incorporating words into our everyday speech much easier. For example: When D asks for an orange, I can say “Here is your naranja” back to him. Though hopefully I will be able to make into an appropriate sentence. We will also include books from the library written in Spanish/English (dual readers). I am still looking for ways to include songs in Spanish. We may even watch a show in Spanish with English subtitles. For now, this is our loose plan. I am not sure how close to Charlotte Mason’s ideas we are but it is certainly a working plan for now.